This is a review of the McDonalds Side Salad. Coming in at $1.00 off the dollar menu, the McDonalds side salad is probably the healthiest, best value going in fast food. The salad includes a couple of different types of lettuce (iceberg and romaine), grape tomatoes, carrots and a mix of other greens, which I call froo froo. All this is tossed together in a plastic bowl with a simple lid. 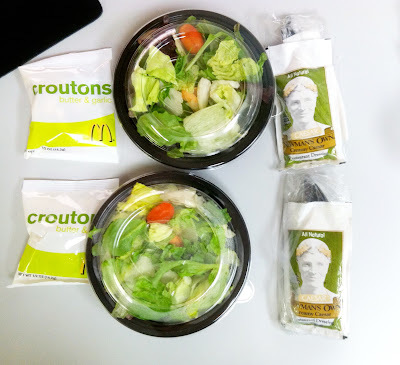 You also get a choice of dressing, I always go with Caeser, and croutons. The dressings are Newman’s Own and are very tasty. The croutons are nothing to write home about, but actually go well with the side salad. I usually buy two salads, combine them in a larger bowl, mix in the croutons and add the dressing. McDonalds sometimes runs out of side salads, but they will make one for you as you wait. I was surprised to see that the ingredients were very fresh and not processed. I thought somehow the lettuce would be canned or dehydrated. No way, all the ingredients were fresh and quickly available. Lunch doesn’t have to weigh you down if you choose the McDonalds Side Salad. Save calories and money.